Visiting the region around Naples, Italy, either on a tour or by ocean cruise? 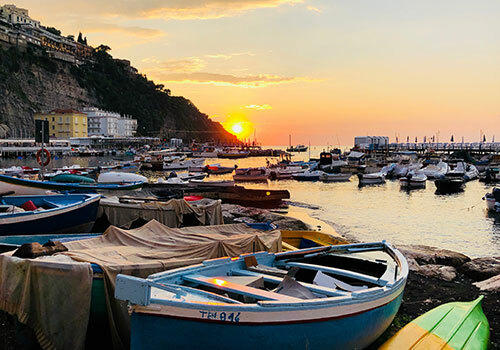 Make the Amalfi Coast a must destination – even if just a day’s excursion to this exquisite coastal area of scattered seaside towns that stretch between Naples and Salerno on the arm of the Sorrento peninsula. It is a UNESCO World Heritage site for a reason. Gigantic cliffs, the face of the Lattari Mounts, border the sea and shape the roads and the town landscapes. Approach from Sorrento or Salerno, both port towns on the “edge” of the region and which serve as great starting or ending points, though not officially part of the Amalfi Coast. (It depends on whom you are talking to whether they are included.) Trains from Rome and other major cities end at these ports and from there one has the choice of buses, private car (rented or chauffeured), and boat as a means of exploration into the region. You can hike as well if so inclined as this area abounds in walking trails. Buses are the most reliable; ferries can be seasonal and then depend on the weather; and you need nerves of steel to rent a car and drive. The SS163 road, though incredibly scenic, is not for the faint of heart with hairpin turns and perimeters that plunge hundreds of feet in the sea. Unless you are travelling in the off-season, bring your pocket book amply filled. This is a popular tourist area which caters to the well-heeled and famous. It can be expensive for shopping, dining and accommodation. That aside, do not miss out. There is so much to see and do here: historic churches and villas, quaint towns with steep alleys and stairways to explore, tasty meals of local seafood, pasta and limoncello*, and stunning photographic moments. Other items to bring with you: a camera, sturdy and comfortable footwear for all the hills and cobblestones, and a sweater for the evening chill. Not needed: competency in Italian (though appreciated). English is spoken most everywhere. Here are a few of the towns you may encounter and what you will find. There are thirteen localities in this region. Amalfi. 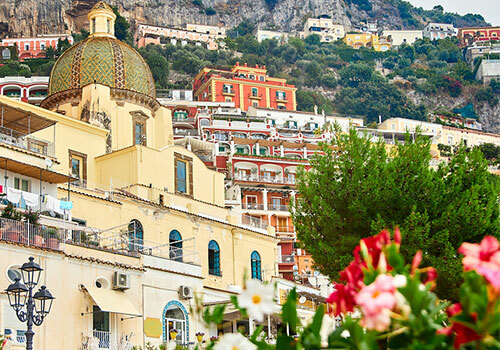 More locals live in the town of Amalfi than seasonal visitors as opposed to Positano. Stroll the Piazza Flavio Gioia named for the inventor of the compass or climb the sixty-two steps to the top of the Duomo (cathedral) from the piazza of the same name. Amalfi’s symbol is the Maltese Cross so you may find souvenirs with this symbol just as one does in Malta itself. Cetara. This is now as Amalfi was before the tourists invaded. It is a charming little fishing town where you can observe fishermen and their colorful fishing boats. Enjoy local seafood dishes in a perfect setting. Positano. Colorful houses stretch up the hillside from the beach. Enjoy the bars, seaside restaurants, and shops. Climb the steps to the top of the town but your best view of the town is from offshore so perhaps take a boat ride. Visit in the off or shoulder seasons as it can be a very busy and crowded place in the height of summer. Praiano. Escape from the crowds of Positano and Amalfi into Praiano. Built similarly to Positano with brightly colored buildings terraced up the hillsides, it provides one of the best views of the Amalfi Coast. Maiori and Minori. One doesn’t visit this area for the beaches as they pale in comparison to actual “beach destinations” but if there is one place where one might enjoy taking in a day relaxing in the sun on the sands, it would be here below the town of Maiori. Its main street has a myriad of shops and restaurants. A short distance away is the similar town of Minori. Furore. Situated centrally along this coast is Furore, worth a visit for the murals on the walls of the buildings depicting scenes of every day life in this area. The town is surrounding by terraces of vineyards, limestone cliffs, and of course the beautiful Mediterranean waters. Atrani. This quiet spot is at the mouth of the Valle del Dragone. Visit its main square and the historic Church of San Salvatore de’ Birecto. Spectacular views of the sea, cliffs, and town make this a great spot to relax, take in the scenery, sip a limoncello or enjoy a gelatto. Image: Nick Fewing on UnSplash. Away form the sea, there are more towns worthy of a visit. Ravello offers one the best views along this coast. Visit Villa Rufuolo, a Roman villa, for the best of the best views. Scala is the oldest town of the region with points of interest including historical monuments and the Basilica of Sant’Eustachio ruins. Tramonti is the place to go for traditional food and for wine. It is surrounded by vineyards and chestnut groves. Here you can feast on local bread and pizza prepared in the traditional manner and with century’s old recipes. Counted within the Amalfi coast is the archipelago of the four Sirenuse islands and the island of Capri. You cannot actually visit the Sirenuse Islands, but they are worth a boat ride and afford good snorkeling opportunities offshore. Capri on the other hand, you can visit and is not to be missed. It has regular ferry service from various points on shore including Naples. Shopping is a must, and dining in the main square. Enjoy a limoncello from a street stand as you stroll the many alley ways. Take boat tours around the island, a highly recommended way of seeing the highlights. If you have many hours to spend, a visit to the Blue Grotto (a sea level cave) is a treat. 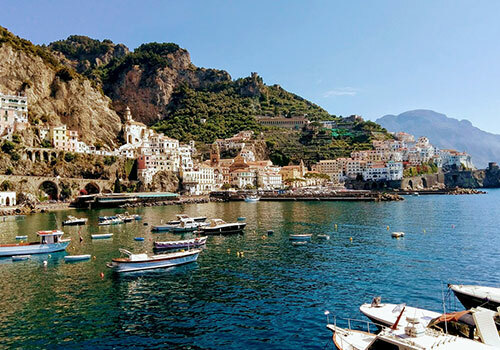 As one can probably tell from this listing of towns, the Amalfi Coast cannot be visited in a day. Allow several to do this area justice. A day may make the drive to one town and return, or a ferry ride and exploration of Capri. Even a day’s limit is well worth your time as you will discover that the Amalfi Coast is a truly magical place that you will want to return to again and again. 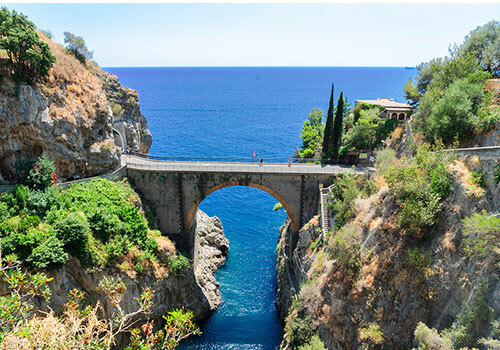 Like to read more on the Amalfi Coast? Here is our recent article on a visit to Capri. Or check out this website devoted to “all things” Amalfi Coast. Feature image of Capri courtesy of Bigstock. 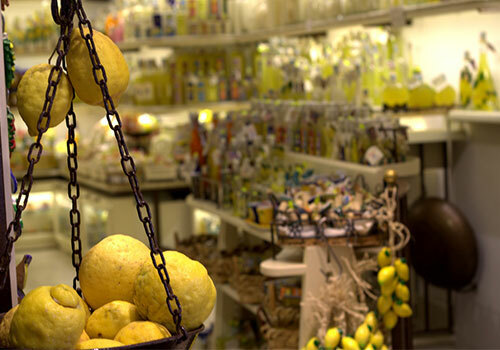 *Limoncello is an Italian lemon liqueur produced mainly in this area of southern Italy.